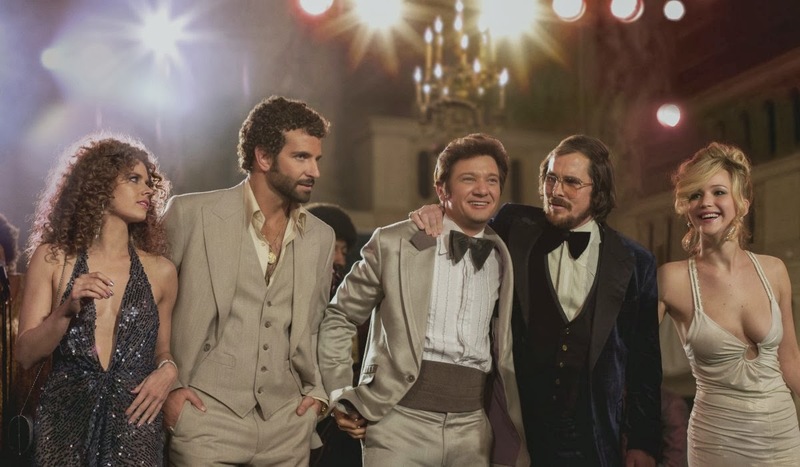 American Hustle, David O Russell's latest hullabaloo, is a comedic drama which never threatens outright hilarity or a crescendo of tension associated with either of these genres. Instead this lightly humorous ensemble feature, a showcase of 70s chic, often feels like Boogie Nights-lite. Christian Bale stars as Irving, a man whose elaborate comb-over hairstyle acts as something of an apt metaphor for the entire film - intricate, ostentatious, ornamental and designed to conceal missing depth. Separated from his unpredictable wife Rosalyn (Jennifer Lawrence in her ongoing audition to become America's official sweetheart), Irving is a scam-artist and low-rent hustler who, alongside his latest partner Sydney (Amy Adams), shucks and bluffs his way through con after con. His existence is threatened when Richie Di Maso (Bradley Cooper), an undercover FBI agent, catches them in a sting - in order to earn leniency from the federal courts, Irving and Sydney (in her guise as English socialte Edith) must co-operate with Richie's plans to use their hustle and bluster to bring down bigger fish. Complications arise when Richie and Edith begin to develop amorous feelings for each other and it becomes clear that corruption leads all the way up to the town's popular, albeit connected, mayor Carmine Polito (Jeremy Renner). Nominated for an array of Academy Awards, it is easy to see why the performers caught the eye of Oscar voters. Whilst the formal composition of the movie will see comparisons made with Scorcese's filmography (the Charlie Brown-esque, exposition filled voice-over, for example, invokes Goodfellas) their is a human warmth to be found in American Hustle that is often missing from the Italian-American auteur's oeuvre. Whilst Scorcese's films (in both content and form) often focus on the masochist or indulgent destructive sides of humanity, Russell has continued to find ways to celebrate the eccentricity and ridiculous nature of the human condition and, in his casting, has found a rag-tag crew who embody his ideals. Amy Adams, perhaps the standout performer of the film, delivers a bombastic turn full of gusto and a committal to playing a preposterous character who, in the film's world, spends most of her time pretending to be an even more over-the-top creation. There's a cackling, manic degree of engagement in Adams' wide-eyed frolicking which transfers waves of joy to the audience caught up in her contagious energy. Similarly too, Jeremy Renner infuses his role with dignity and pathos; he provides American Hustle with heart and a redeemable soul. Adams' Sydney/Edith, however, provides American Hustle with another post-modern, self-reflexive summary of it's self. Russell's latest feature is a film about people pretending to be things they are not in a movie which is equally pretending to be something it is not. Whilst American Hustle is much more focused than the askew Silver Linings Playbook, the film is also exponentially less anarchic, eccentric and, for that matter, humorous than his earlier comedies I Heart Huckabees and Spanking the Monkey. Here, Russell seems to want to make us laugh with a light and loosely plotted screwball film which is low on jokes, pratfalls or matters or mirth. Yet, there also appears to be attempts at manipulating emotion in a narratively flimsy film low on dramatic developments too. In movies where the balance between belly laughs and profundity can be managed with expertise (take for example, the aforementioned Paul Thomas Anderson film Boogie Nights or Magnolia), magic can happen. Here, the balance feels like an empty con - the magnificently wardrobed American Hustle is held up by hairspray and little else. An incongruous jumble, American Hustle's supporting cast and Lawrence's stellar turn lingers in the eye, not the movie as a whole. For a film that perhaps attempted to break a mold, it suffers from simply not knowing what it wanted to be.